Jason Murray of IMBA Canada rides Copeland Forest with CTS to help save the trails. Will you join us in convincing MNR/Couchiching Conservancy and other user groups that mountain biking is a good thing for our community, and that we should not be simply tolerated but accepted? 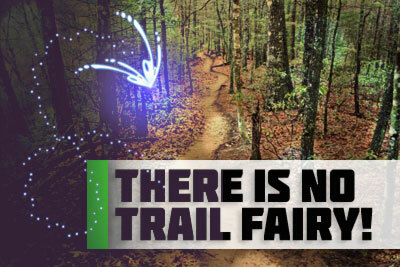 There Is No Trail Fairy! 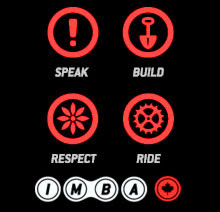 Once you enter into the world of mountain biking it's easy to understand why so many people love it, but it's also easy to forget it takes a lot of work to create and keep trails operational. The trails we love to ride don't build themselves. They are supported by dedicated volunteer builders. The MTB trails at Copeland Forest don't presently have an organized group maintaining them. This leaves the trail as illegal in the eyes of the MNR. Over the next three years, the Couchiching Conservancy will be coordinating the creation of a Copeland Forest Stewardship Committee. This is being done to find a dedicated group of volunteers to support and maintain the interest of the forest and the community that uses it. Will you join me in convincing MNR/Couchiching Conservancy and other user groups that mountain biking is a good thing for our community, and that we should not be simply tolerated but accepted? St. John's Anglican Church, Craighurst. Drop in between 5 and 8 p.m.
Hello. How 'bout that ride in? I guess that's why they call it mountain biking. [laughs] You guys might not know this, but I consider myself a bit of a loner. I tend to think of myself as a one-man wolf pack. But when my sister brought Jay home, I knew he was one of my own. And my wolf pack... it grew by one. So there... there were two of us in the wolf pack... I was alone first in the pack, and then Jay joined in later. And six months ago, when Jay introduced me to CTS, I thought, "Wait a second, could it be?" And now I know for sure, I just added 30 more guys to my wolf pack. 30 of us wolves, running around the forests, in Simcoe, looking for berms and beer. So tonight, I make a toast! 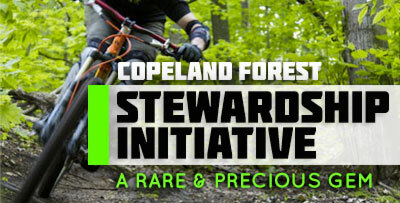 Copeland Forest Stewardship Initiative Launched. If you visit the Copeland Forest for recreation and relaxation, we hope you will get involved in an innovative project to help put users of the Copeland Forest in the driver's seat. While the Ministry of Natural Resources will continue to have ultimate management control over Copeland, they are interested in working with those who use and love the forest to help with management decisions and participate in stewardship activities. Over the next three years, the Couchiching Conservancy will be coordinating the creation of a Copeland Forest Stewardship Committee, comprised of people like you who like to do anything from ski and snowshoe to horseback ride and picnic in the Copeland Forest. In the first phase, we are compiling scientific information such as a four-season biological inventory, a lichen study, aquatic species research, and a human footprint study. All of this information will ultimately help the stewardship committee make informed decisions. Additionally, we will be holding educational workshops (see "Wetlands and Watersheds" article) and speaking with as many people as possible about how you use the Copeland, how often, and what you value about it most. Increasingly, our forests are becoming fragmented islands of green, too small to support forest interior habitat. While forest cover is decreasing, human populations and development are increasing, and it is more important than ever to care for precious forests like the Copeland. Joel's epic crash and the CTS Bike club Rockin' it in Crownland Forest.